Welcome to another edition of Two Cents Tuesday. We are going to periodically have some guest bloggers and today my friend Ashley is sharing some of her favorite things! I’ve known Ashley for years, we met at Towson University. I’ve had the honor of capturing some important moments in her life….including newborn photos of her daughter, family photos after her son was born, an extended family photoshoot just a couple of months before her sister suffered a traumatic brain injury, and finally her mom’s wedding just this past October. Ashley is an amazing person and I feel so lucky to call her my friend. I’ve seen her go through this season with so much grace and strength. Meet Ashley! 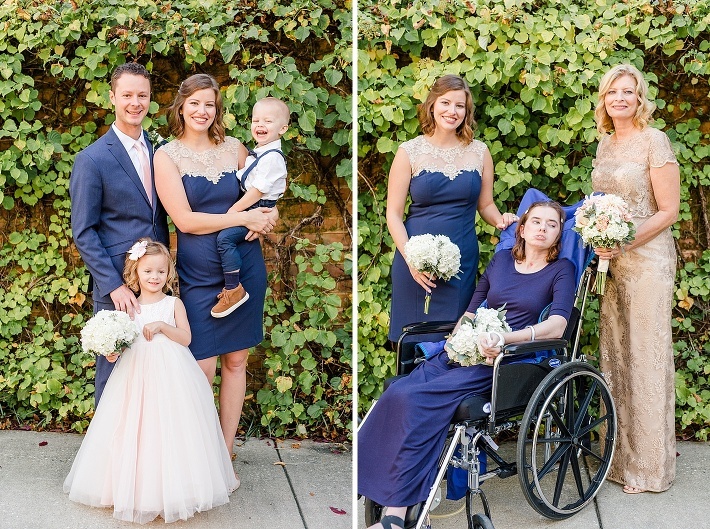 Pictured below on the left is Ashley with her husband and two kids, on the right is Ash with her mom and sister. Hello!! I’m Ashley! I’ve had a blog for just about three years now. It started out as my musings as we rented out our first house and bought our second. I had fun renovation tips, rental tips, packing and living and mothering throughout the whole thing tips, etc. As the renovations slowed down my sister sustained a traumatic brain injury. I’ve spent the last almost two years (somewhat) publicly walking through the pain, questioning, heart ache, and hope of living through the aftermath of her recovery. I throw in seasonal “Favorites” lists and anything else I feel led to share. I’m happily (unless we’re renovating something. No seriously) married to my hubs of 8 years and the mom to a 4 year old and 2 year old. I hope you join me in loving the things I’ve been loving lately! Threading at Usha Salon. You can find it no place cheaper and quicker (in Towson)! I’m in and out in 3 minutes without an appointment. Jen Hatmaker’s newest book, Of Mess and Moxie. I laughed. I cried. I wanted to read it again immediately. These Sperry duck boots. They are making me happy and keeping my feet warm. The children’s book, What Happens When I talk to God? My mother in law just gave this book to my kids for Easter and it is PRECIOUS! It is such a great explanation for little ones of why and how to pray. Stevia Extract POWDER from Trader Joes. They don’t have it on their website for some reason but do yourself a favor and grab one the next time you’re in the store to save at least $5. It makes tea sweet without leaving a wonky after taste. Its zero calories and delicious. Luzianne Cold brew. I’m all about iced tea. I stick four of these bags in a two gallon pitcher, fill it with cold water, unload the dishwasher and its done. I love it! I sprinkle some stevia powder on my ice and pour it in. Its so yummy! This is kind of silly. I’m constantly trying to make myself drink more water. I downloaded an app called Plant Nanny. Each time you drink a glass of water you push a button on the app and it “waters” your plant. After several days of enough water you can plant it in the “garden”. If you don’t drink enough water the plant dies. So there’s that. It’s oddly satisfying to watch it grow! I apologize if you are offended by this. I am all about my children being confined. I like them to sleep. I want my son in his crib for as long as possible. I borrowed this type of tent from a friend and it is so, so good. I zip him up at night and he can’t get out. But we can still see each other. He loves it! True story, he has actually escaped it a couple of times when I haven’t zipped it up totally up but all-in-all it is awesome. Thanks so much Ash for sharing some of your favorite things with us!